Due to our successes with slow roasting a shoulder of lamb with garlic and rosemary, we thought we would try a different slant on it this weekend and give it a Moroccan style treatment. We had half a shoulder and the evening before cooking it, we rubbed it with a spice mix and left it in the fridge overnight before cooking in the usual way. It worked brilliantly, giving the same succulent, deeply flavoured lamb except this time it had a spicy crust and aroma. We served it with couscous and turlu turlu (which is a roasted vegetable dish from the Moro cookbook). The day before you plan to cook the lamb, prepare the spice mix by mixing together all of the spices. Score the skin of the lamb shoulder lightly and then rub it all over with the spice mix, working it well into the meat. Wrap the shoulder tightly in foil or cling film and refrigerate it overnight. On the day of cooking, preheat the oven to 150C. Break up the garlic bulbs into individual cloves, but no need to peel the cloves. Sprinkle half of the garlic into the bottom of a lidded casserole big enough to hold the lamb shoulder. If you don’t have one big enough then you can do it in a roasting dish and cover it with foil. Unwrap the lamb shoulder and place it on top of the garlic cloves, then sprinkle the rest of them on top of the lamb. Put into the oven for 3.5 to 4 hours with the lid (or foil) on. There is no real need to babysit the lamb, it will quite happily cook itself slowly, but it’s fun to check on it now and then as you can smell the delicious spices drift through the kitchen. When the lamb is cooked, remove the casserole dish from the oven and remove the lamb shoulder to a large plate and cover it with foil to keep it warm while it rests. Be careful when moving the lamb, you might need to get a large spatula underneath it to prevent it from falling apart. Take the roasted garlic cloves out of the casserole and put them onto a plate, then squeeze the delicious roasted garlic out of the skins. Pour most of the oil out of the casserole, then put it onto the hob on a medium heat and add stock and the roasted garlic pulp. Bring the stock to a simmer, scraping the bottom of the casserole with a wooden spoon as you do so, to mix in all of the delicious lamby bits. Then add the chopped preserved lemon skin and the olives, the coriander leaves and the mint leaves. Let it simmer for a while, stirring often. The lemon should add both a sourness and a bitterness to the sauce, to balance out the herbs and the sweetness of the caramelised lamb juices from the casserole. You can thicken it if you like, but we generally don’t. Check and season with salt and/or pepper before serving. 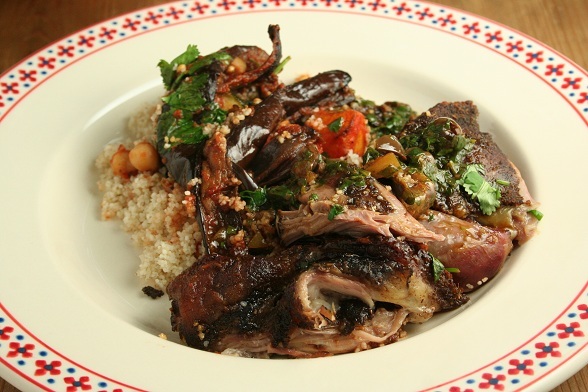 Then pull the lamb apart with a couple of forks and serve with the sauce and whatever else seems appropriate – we went with barley couscous and “turlu turlu” roasted vegetables and chickpeas. Delicious! Mix all the vegetables apart from the courgettes together with the oil, garlic, spices and salt and pepper. Spread onto a baking tray and cook in a pre-heated oven (220 degrees) for 45 minutes, turning every 15 minutes. Add the courgettes and cook for another 15 minutes. Heat the pasatta and chickpeas together and then stir in the cooked vegetables, Season, add the herbs and serve. 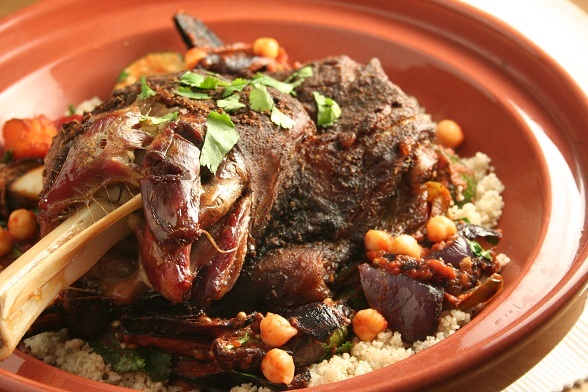 Subscribe to comments with RSS	or TrackBack to 'Slow Roast Shoulder of Lamb – Moroccan Style'. It looks gorgeous; I don’t eat enough cous cous really and this looks perfect with it. .-= Lizzie´s last blog ..Ben Greenos Supperclub =-. Thanks, Lizzie. This was actually barley couscous which is a bit chewier than the ordinary stuff. It worked quite well with the lamb and the “gravy” though. Thanks Hilary 🙂 Really good idea for a post too. Looks like a great recipe – I had something similar and want to do it for a Sunday lunch party. But tell me – the photo shows chickpeas, but there’s no mention in the recipe. Is the photo with turlu turlu as well, or are the chickpeas cooked with the lamB? Just prepared a shoulder using some of your tips, cling-filmed it up and leaving it for 24 hours – can’t wait to taste the results tomorrow night! Thanks Toby! The chickpeas were in the turlu turlu, which we had around the lamb in the picture. Good luck, hope it turns out well! I’m cooking this for Sunday lunch this weekend, with couscous and roasted peppers. It’s been well spice-rubbed and it sitting in the fridge as we speak. Can’t wait! This is the first time my husband has let me cook lamb for him in all our time together – he says he doesn’t like it – but I’ve convinced him to try it again. No pressure then! I used quinoa instead as I’m wheat intolerant : it was beautiful & will be a regular meal in our home.. The lamb was perfect! Is 150 degrees for a fan oven or a normal one? Hi Bethany, our oven is a fan oven and that is what we did it on. Maybe put it very slightly higher on a non-fan oven I think.